Reprinted by kind permission from Neals Paper. 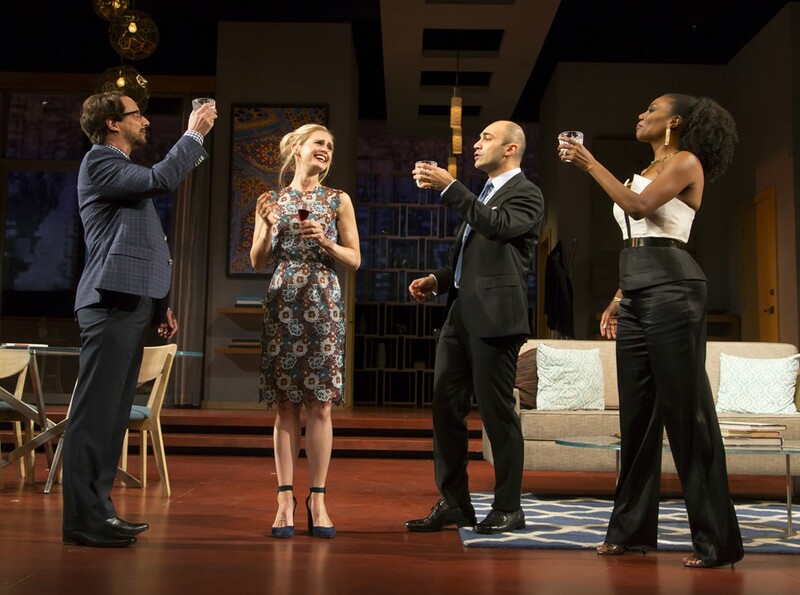 Kevin Isola, Caroline Kaplan, Maboud Ebrahimzadeh, and Austene Van in DISGRACED. Photo by T. Charles Erickson. Of the three productions I’ve seen of Ayad Akhtar’s honest, far-reaching play, Marcela Lorca’s staging for Princeton’s McCarter Theatre is the best. One reason for that is the stirring tour de force performance of Maboud Ebrahimzadeh, already in award contention for his work in another Akhtar piece, Theatre Exile’s The Invisible Hand. Ebrahimzadeh thoroughly and humanly shows you the thousand compartmental traits and dimensions that compose his character, Amir Kapoor. Kapoor is Pakistani Muslim who understands all too well his national, tribal, cultural, and religious heritage and chooses, with clear eyes and less self-hatred than he is accused, to assimilate and put labels, stereotypes, inferences, and expectations behind so he can be an individual pursuing his American dream encumbered with as little baggage as possible. Akhtar’s art and Lorca’s gift at McCarter is to show how every character in the play embarks on a journey similar to Amir’s. The five people we see are thoughtful and represent a bomber crew of ethnicity — WASP, Jewish, African-American, young and searching for identity — who have their own personalities and objectives but are constantly mired in the cultural trappings and attitudes they are presumed by general association with a race or religion to have. The beauty of this production is Lorca and the remarkable cast Ebrahimzadeh leads, show the McCarter audience the complexities of which each character is composed. As in life, no one is one thing. We all battle against parts of our upbringing and our prejudices, taught or acquired, to be sensible, rational people looking to make ourselves comfortable in a world that prefer the easy route of profiling. Raw sensitivities are exposed in this production. You see how nature and nurture confound each other more than they combine towards perfection. You see an instance that can easily be blamed on cultural tradition but, via Lorca and her cast, could also be the result of confluence of intense and escalating calamity leading to an emotional reaction that is more a matter of wit’s end than birthright or tradition. Akhtar addresses clearly and boldly what most current playwrights, in their effort to be good and nice, tiptoe around. He shows people in their fullness. He has them talk candidly and openly about who they are, what’s on their minds, and what is happening to them in the real world and in their own. 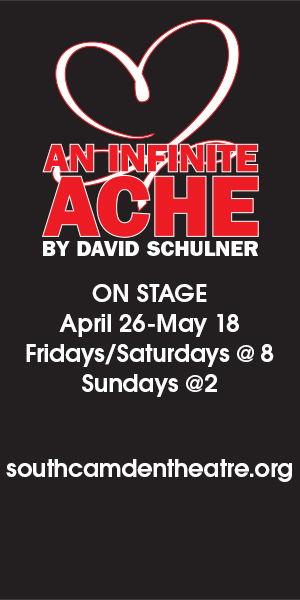 Nothing is simplistic in this play, although other productions of it have aimed for simplicity and one note instead of the sympathy Lorca conducts with Ebrahimzadeh as her virtuoso. Important, elemental things are said and done on the McCarter stage. Each character, even eventually Amir’s WASP wife, Emily, addresses what they go through because of the way people see them as opposed to who they are. Each reveals how segments of his or her culture continue to influence thought and action even though much of the tribal and religious has been put in perspective and comes out in proportion. Lorca and company go past surface emotion and the red herring Akhtar plants to give his play some pivot, Amir’s fortunes descending when an incompetent New York Times reporter misrepresents his involvement in a legal case that puts him in Dutch with the managing partners of the swanky Manhattan law firm to which he aspires to become a partner. Akhtar addresses situations of ethnic identity that have currency but are also woven into the American fabric. Amir, Akhtar, Lorca, and fellow actor Austene Van, as a African-American colleague of Amir’s, put the ongoing, American dilemma about cultural identity in a nutshell. Mainly because Ebrahimzadeh and Van could play such complete people while reverting in some primitive way to their ethnic roots. Ebrahimzadeh makes you empathetic to Amir’s breakdown even while your horrified, and even appalled, by it. It is this multi-layered expression and understanding that theater should aim for, and Lorca and her cast at McCarter are providing it. The Broadway production of DISGRACED took a more specific course than Lorca’s. The Philadelphia Theatre Company’s staging was woefully shallow in comparison to McCarter’s, and it had its power. Lorca’s production lets you a broad, knowing, and disturbing picture. Disturbing on several levels, one being that Amir cannot go about his life on his own terms, even when he says things that sound outrageous but are honest and true on some level, another being that a life can be altered by a reporter’s stupid mistake and other people taking that mistake to heart, a third being that we do hear the voices, even if we regard them sarcastically, of people indoctrinating us with tradition. We live in a hair-trigger world. Sensitivity is so out of proportion, it is fashionable to take offense at the inconsequential or lightly meant. We all face a McCarthyesque inquisition by the new Puritans, the politically correct who have all the humor of a bypass patient during the operation. DISGRACED addresses all of this and it does so in an intelligent and telling way. The play invites all kinds of productions. I’m told Akhtar’s piece is especially popular in Germany and has been staged in numerous ways with numerous emphases. The McCarter production, en route later this season to Minneapolis and The Guthrie, is divinely thorough. It delineates the important, keeps all dramatic, and lets you see the multiple permutations at work as we try to exist as individuals today. Maboud Ebrahimzadeh is an actor of super-tactile sensitivity and honest emotion. He refuses to make Amir monolithic and fearless broaches subjects that make Amir controversial before and after the damaging New York Times piece comes out. Austene Van is right behind Ebrahimzadeh in showing a woman who is proud of her heritage but conquers stereotypes until her marriage is threatened and her attempt to be a friend in questioned. Adit Dileep strikes all of the right notes as Amir’s confused teenage nephew who struggles yet with the borders of individuality and tradition and who may be pushed closer to Hussein than Abe by the treatment he receives when a friend of his, also Muslim, makes a flippant remark, pregnant but truly meaningless, in public. Caroline Kaplan and Kevin Isola round out the excellent cast. 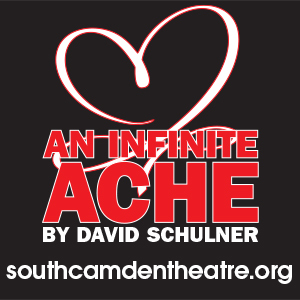 [McCarter Theatre, 91 University Place, Princeton, NJ] October 9-30, 2016; mccarter.org. Neal of the Nealspaper is a fan of all forms of live entertainment, movies, and television. He is also a constant reader and a frequent traveler. He writes for NealsPaper.com, a place for people to come to read one authoritative voice in the dialogue, and find out what might be worthwhile — or not — as you plan your entertainment outings.